As we begin commemorating the 150th anniversary of Trinity University’s founding, the library’s Special Collections & University Archives have had more and more requests for information about the school’s history. Three of the sources we use the most often–the Trinitonian newspaper, the Mirage yearbooks, and the Course of Study Bulletins–have all been digitized and are available online. The library uses a platform called ArcaSearch to host these three publications. All three can be searched simultaneously by following this link. 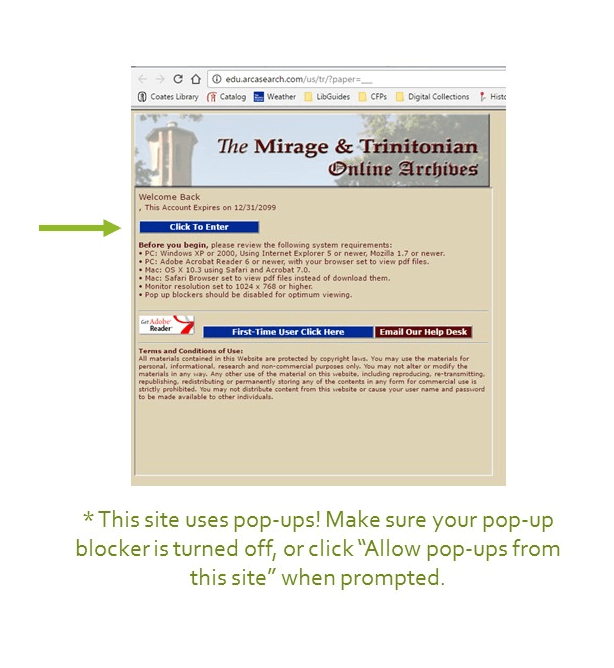 The site does use pop-ups, so be sure your pop-up blocker is turned off, or click “Allow pop-ups from this site” when prompted. 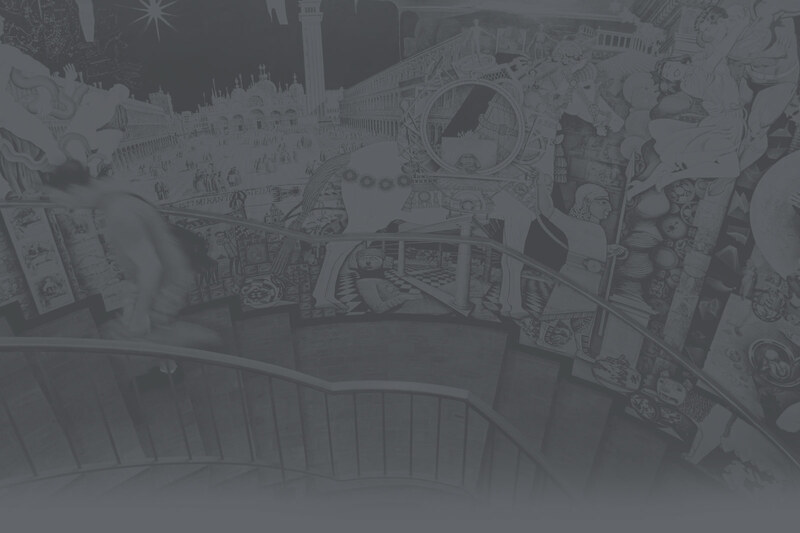 We also suggest maximizing the main navigation window. Searches can be limited to the Trinitonian, Mirage, or Course of Study Bulletins, or you can search all three at the same time. Searches can also be limited to specific date ranges, or you can browse specific issues of each publication using the date drop down menu. 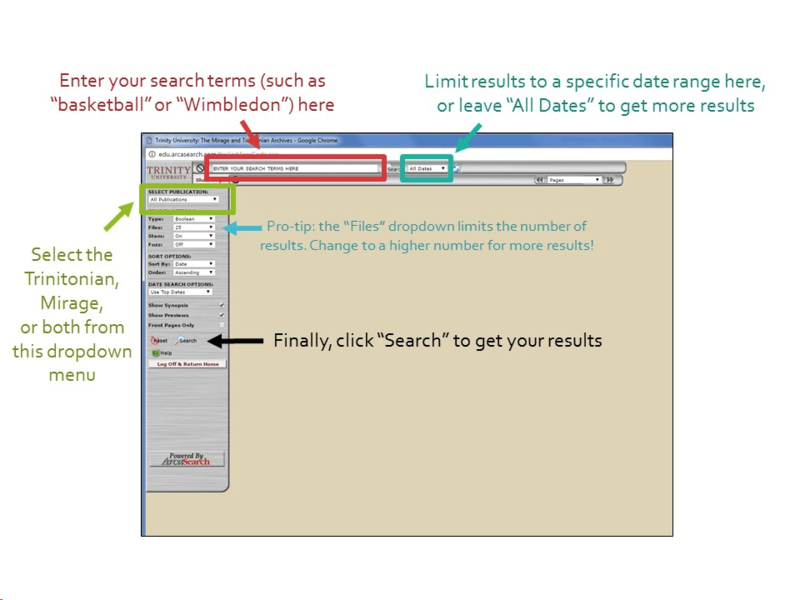 For more searching tips, including a refresher on Boolean searches, click the green “Help” button on the left-hand menu. When reviewing your search results, you can hover over a result to preview that page. Click on the result to open the full-size image. 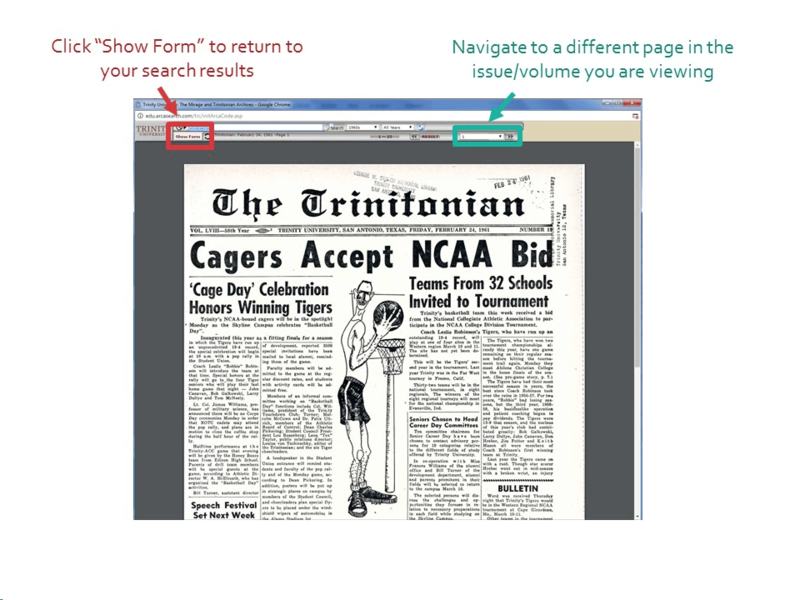 You can navigate to a different page in the issue or volume you are viewing on the right side of the top navigation bar, or you can click “Show Form” to return to your search results. Every page can be printed or saved as a PDF file by clicking the appropriate icons when viewing the full-page image. 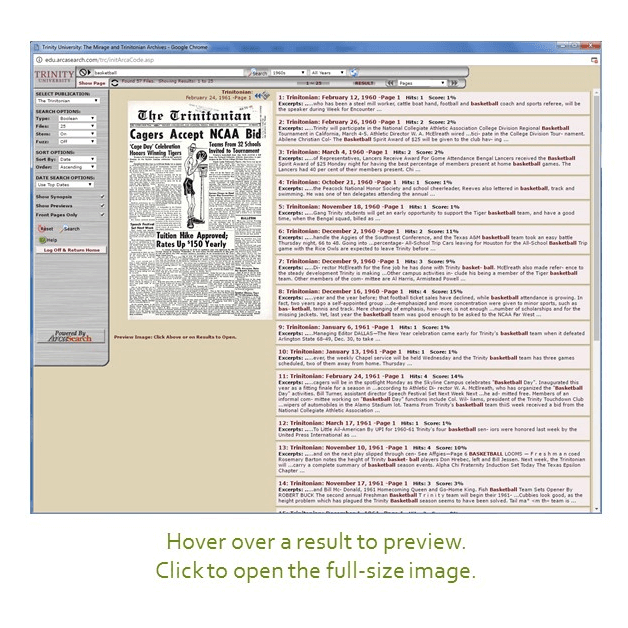 ArcaSearch is a great resource to learn more about Trinity University’s history, but it is not always the easiest site to search. If you find yourself running into trouble and need more assistance, don’t hesitate to email Special Collections & Archives at archives@trinity.edu.